There are a number of distinct signs that rats have invaded your attic. You only need to open the door and you will soon be able to identify where they are nesting. These nasty critters can be very dangerous, as they have been known to spread diseases, so it's very important to identify whether or not these pests have infested your home. Even before you go and check the attic, your dog or cat will probably announce the presence of a rodent somewhere in the house. Having an excellent sense of smell, the pet will quickly identify the scent of their urine, which will cause them irritation and unease. They will often start running around and will show signs of distress and anxiety. Because rats carry a number of disease that are harmful to dogs and cats as well as to humans, it is better that they don’t catch and kill the rodents, as they can become infected that way. In case of a rat infestation, you will most likely find their droppings around the nest and sometimes in the attic, kitchen, or anywhere else they ventured in search of food. A Norway rat's droppings are typically brown and are blunt on both ends, while its roof dwelling counterpart leaves more dark, and pointy droppings behind them. Both are about 0.6” to 0.8” long. Accompanying these 'gifts' is always a foul musky smell of their urine, which of course becomes stronger if there is an entire colony of these pests. If you decide to try and clean and de-contaminate the attic section yourself, you need to make sure you wear protective gear including a facemask, to avoid contacting any disease these critters may care. Going with a professional, like our experts, is usually the better option. Rat teeth grow continuously, which often makes them chew and gnaw at rough wooden objects like baseboards, door and window frames or inside cabinets. The marks are quite noticeable and can be as long as 1/8”. If your pet starts getting irritable and you hear scratching noises from inside the walls or from your attic, professional rodent proofing and removal will probably be required. In addition, because rats run along the bottom of the walls, they often leave grease marks along baseboards and wooden floors. If you clean the house often, these smudges will immediately indicate the presence of a rat. 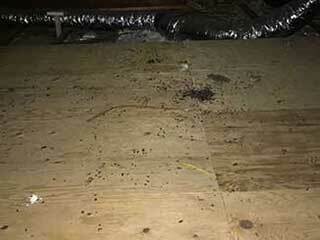 Contact our team at Attic Cleaning Simi Valley and let our experts deal with these potentially dangerous critters.